You have to give Nike some credit. Knowing that the American economy is in a bit of trouble these days and a lot of it stems from the fact we don't manufacture anything within our own borders anymore, the folks at the shoe company giant have decided to bring some work back to the United States. No longer are Vietnamese children making Nike's gym shoes for pennies a day, it's American children doing the work now. And at better rates too! When Kobe Bryant and the Lakers take the court at the United Center on Saturday night, Bryant will be doing so wearing his new shoes. Shoes that were designed by students from Chicago's Claremont Academy Elementary School and Parkside Elementary Community Academy. 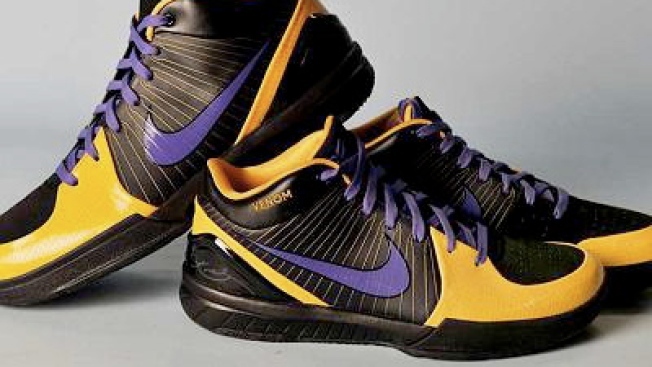 The Nike Zoom Kobe IVs are designed with Bryant's nickname of "The Black Mamba" in mind. Predominantly black with the classic Nike swoosh in Lakers purple, the shoes also feature Laker gold snakeskin on the front toe and on the back of the shoe. Unfortunately when they become dirty, the shoes do not shed their skin and grow a newer cleaner one. Which is somewhat of a disappointment, but what do you expect from free child labor? As for those of you who may be upset about the fact that snakeskin is being used in the shoes, let's just be happy Bryant's nickname isn't the Leaping Panda. Along with writing for NBCCHICAGO.com, Tom Fornelli can also be found contributing at FanHouse, SPORTSbyBROOKS, and his own Chicago sports blog Foul Balls. He's wearing New Balances with holes in them.